The coastal waterways of British Columbia in which we operate is home to a wide range of marine animal species. Pacific Northwest Expeditions recognizes that we have a responsibility to minimize the potential direct and indirect impacts of our activities on all marine wildlife. This means ensuring that negative associations and impacts are avoided, and that animals can continue their normal life processes and use necessary habitats without disturbance. With the help of marine biologists and researchers we continually evaluate our behaviour practices around wildlife. 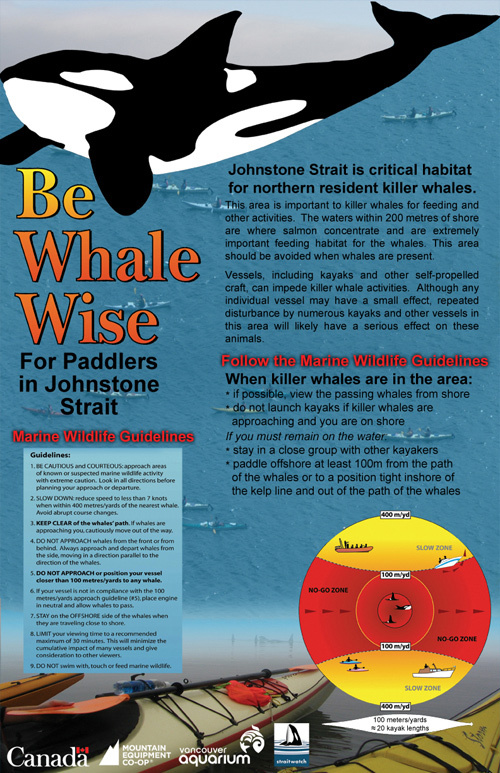 Using the 'Be Whale Wise Guidelines' as our benchmark we have developed responsible wildlife viewing guidelines for all our sea kayak touring trips. Respecting the wildlife and following these guidelines will help ensure that we do not cause the animals unnecessary stress.